On the 14th September 2018 the University of Bristol hosted the 6th Annual Technicians Conference, celebrating the important role technicians play in research, and the delivery of an excellent learning experience, for students at the University of Bristol. Science Council trustee Professor Patrick Kniveton presented University of Bristol’s Pro Vice Chancellor for Research, Professor Nishan Canagarajah, with the Science Council Employer Champion Award for the commitment the University is making to encourage technicians to become professionally registered. 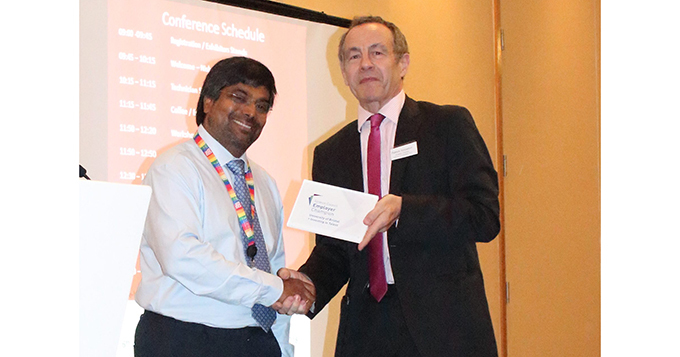 Professor Canagarajah showed his own support in a speech that highlighted the ways in which the University is supporting the visibility, recognition, career development and sustainability of technical careers, with the Employer Champion Programme being one of them. Presenting the plaque, Professor Kniveton welcomed the progress the University of Bristol had made in promoting and encouraging technical staff to become professionally registered. Many congratulations from the Science Council to both the University of Bristol for supporting and encouraging professional registration and to Tom, Saranna and Caroline. The University is also a founding signatory of the Technician Commitment, a university and research institution initiative, aiming to ensure visibility, recognition, career development and sustainability for technicians working in higher education and research, across all disciplines.